Chanel is popping up again in St. Tropez this summer. 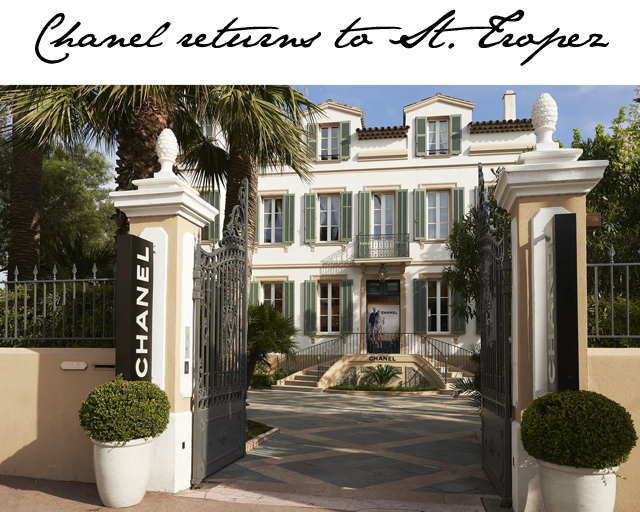 Celebrating it's fifth year in St. Tropez, Chanel takes up it's summer residence at La Mistralee from April 26th straight through until October 2014. That's basically a time frame that allows for no excuse for not visiting. Get thee to St. Tropez! Upon arriving at the Chanel Summer residence in St. Tropez, you'll discover the brand has been strongly influenced by the 2013/14 Metiers d'Art Paris Collection, which you may remember was showcased in Dallas last year. The Chanel St. Tropez shop isn't just for shopping, although you can satisfy all your Chanel needs there, from clothing to accessories, beachwear to towels. This shop features a beautiful pool, surrounded by chairs so you can sit and take in the luxurious atmosphere around you. There's even a garden to explore. In St. Tropez, let's just call this a one stop shop.